While we still wait for global availability of Samsung’s newly coming smartphone, Galaxy S5, a website has posted purported specifications of the rumoured Galaxy S5 Mini, the compact-variant of the flagship. ‘Sammobile’ claims to have received some insights on the innards of the alleged ‘Galaxy S5 Mini’ from a source. The website claims that Samsung’s mini version of the Galaxy S5 will come with model number ‘SM-G800’. The website has also posted some specifications of the Galaxy S5 Mini, which includes a 4.5 – inch Super AMOLED display along with HD (720p) display, which can be considered scaled down when its compared to Galaxy S5’s 5.1-inch Super AMOLED display along with full-HD (1080×1920 pixels) resolution. On the software point, the Galaxy S5 Mini is said to run on Android 4.4 KitKat, much like Galaxy S5. However, there is no word whether the yet to be announced Galaxy S5 Mini will pack some features like as the fingerprint scanner, and IP67 certification for dust, heart rate sensor and water resistant. Other leaked specification includes a quad-core Snapdragon processor, 8-megapixel rear/back camera and 2-megapixel front camera along with 1.5GB of RAM, 16GB inbuilt storage, an IR blaster, and 2100mAh battery. The company announced that the smartphone price in India will be between Rs. 51,000 and Rs. 53,000. 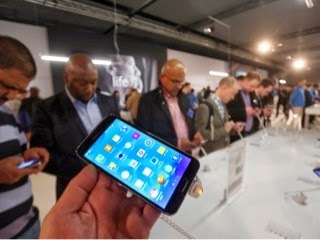 Samsung said it would reveal the exact pricing for its new smartphone ahead of the 11th April availability. The Galaxy S5 comes with the 2GB of RAM and available in 16GB inbuilt storage model only, along with microSD card expandability up to 64GB. Its having a 16-megapixel rear camera along with HDR (for video as well) and a 2.1-megapixel front camera. The rear camera can record ‘UHD video’ @30 fps along with HDR, and video stabilization functionality.